Honda Activa brand crosses 20 lakh sales mark in just 7 months! Honda Motorcycle & Scooter India Pvt. Ltd. (HMSI) – the growth driver of Indian two-wheeler industry has today set a new record. Honda Activa is now the ‘Only brand in Indian two-wheeler industry’ to cross 20 lac unit sales in just 7 months. Today, a new family is buying their favorite Activa every 9th second! While it took 7 years since its launch (2001 to 2008) for Activa to delight 20 lac Indian families, the latest 20 lac customers (2,040,134 unit sales) have joined in just 7 months from April to October 2017! Activa has touched the hearts of Indian families like none other two-wheeler brand till date. In just half a decade, two-wheeler industry has seen sales grow by a phenomenal 52%. In comparison with sales growing 180%, Activa has become India’s highest selling two-wheeler and has broken all past records of popularity of any brand in the history of Indian two-wheeler industry. Scooterizing India like never before, Activa sales have nearly tripled in this period from 7.3 lac units in 2012-13 to over 20 lac units in 2017-18. Reactivating the scooter segment, Honda launched its revolutionary 102cc automatic scooter Activa in 2001. 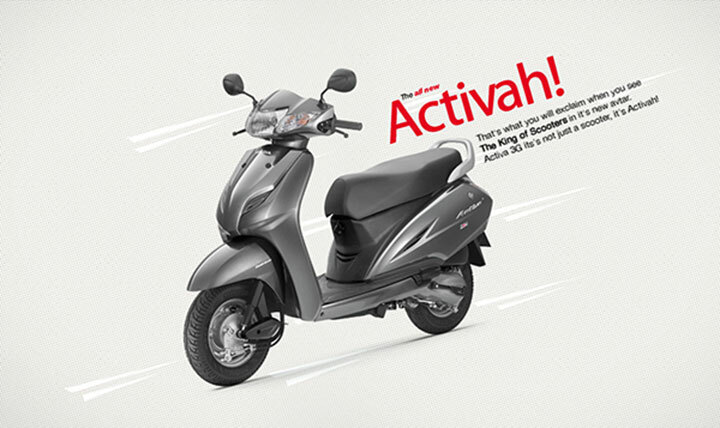 Sales touched 55,000 units in its debut year itself and in the next 3 years Activa grew to become the leader in scooter segment. By Dec’2005 Activa’s cumulative sales touched the 10 lac units mark. Over the years, Activa has reinvented several times. 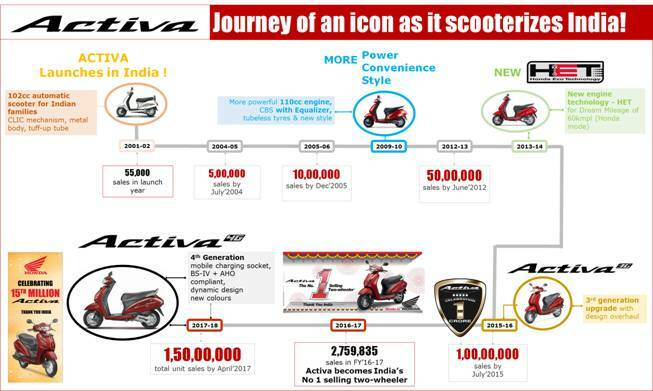 With this continuous evolution, Activa has changed the way India rides and grown in popularity sharply. By June 2012, Activa had breached the 50th lac cumulative sale milestone. In the next 3 years, Activa shattered the glass ceiling to become the first scooter to sell over 1 crore units. Just one year later in 2016, Honda’s iconic Activa dethroned the 17 year legacy of motorcycles to become India’s and World’s No. 1 selling two-wheeler brand for the first time. Leading India’s scooterization, Activa is now the first automatic scooter to cross 1.5 crore customer mark. In 2017, Activa continues to grow even further. Such is the trust that a new family is buying their favourite Activa scooter every 9th second today!